Managers and shareholders have different attitudes about particular types of risk. Most shareholders have stock in a variety of firms, so a risk that affects only one firm may not pose much of a threat to their total portfolio. In contrast, managers usually have a large stake in their firm. Not only do they own stock and perhaps options to purchase additional stock, but also their salary is tied to their firm. Whatever happens to that business really matters to the managers. Managers whose stock holdings are poorly diversified may cut back on investing when uncertainty about their firm’s prospects increases. This may be true even in the case of “idiosyncratic” or “firm-specific” risk, a threat to just one business or one small industry segment. If managers become overly cautious, they might make decisions that cause the firm to miss out on high-risk/high-return investment opportunities that could maximize shareholder profits. Dimitris Papanikolaou, an assistant professor of finance at the Kellogg School of Management, and Vasia Panousi of the Federal Reserve Board wondered whether the negative relationship between investment and firm-specific risk is stronger when managers own a larger fraction of their firm. Prior research has documented that as firm-specific risk increases, investment decreases for publicly traded firms in the United States. Papanikolaou and Panousi applied an econometric model to data from publicly traded, nonfinancial firms listed in Compustat from 1970 through 2005. The managers they considered were the ten highest-ranking firm officers, and managerial ownership was defined as the fraction of the firm’s total shares held by these managers in each year. The bottom quintile of managerial ownership was considered low ownership and the top quintile was considered high ownership. Papanikolaou and Panousi’s research showed that investment in firms where the managers owned a high proportion of the firm’s equity was more vulnerable to the effects of firm-specific risk (Figure 1). Specifically, the same increase in firm-specific risk was associated with a four times larger reduction in the investment-to-capital ratio in high-managerial-ownership firms, compared with the corresponding reduction in low-managerial-ownership firms. Moreover, the 1 percent decline in investment rate in high-managerial-ownership firms was economically significant, as their average investment-to-capital ratio was 10 percent. Figure 1. An increase of one standard deviation in firm-specific risk is associated with a reduction of 0.25 percentage points in the investment-capital ratio of low-managerial-ownership firms (blue bar). The same increase in firm-specific risk corresponds to a reduction of more than 1 percentage point in high-managerial-ownership firms (red bar). “If the manager is also the owner of the firm, then whatever happens to that firm will matter for the manager/investor—even though it may be a risk that affects only this particular firm or a very small number of firms, that is going to matter for that investor,” Papanikolaou explains. “That firm will then start behaving in a more risk-averse way.” During times of increased uncertainty, the manager, in an attempt to avoid risk, may not undertake investments that could increase the value of the firm. The researchers found that firm-specific risk had an impact on investment only in companies with low institutional ownership. Other authors have suggested that large institutional investors, such as pension funds and mutual funds, often provide an oversight of sorts for managers of firms in which they have invested. Papanikolaou and Panousi tested this assertion as it pertains to their investment-risk analysis. They started by organizing firms into three equal-sized groups, based on their level of institutional ownership. Within each group, they then classified firms into three groups based on managerial ownership. The researchers found that firm-specific risk had an impact on investment only in companies with low institutional ownership. In such firms, a one-standard-deviation increase in firm-specific risk reduced the investment-to-capital ratio in high-managerial-ownership firms by 1.5 percent (Figure 2). In contrast, the same increase in firm-specific risk had hardly any impact on the investment-to-capital ratio in low-managerial-ownership firms. Furthermore, this increase in risk did not result in a substantial reduction in investment in firms with high institutional ownership, regardless of the amount of managerial ownership. Figure 2. 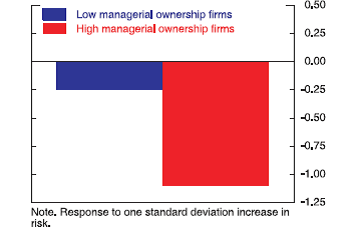 In firms with low institutional ownership, a one-standard-deviation increase in firm-specific risk reduces the investment-capital ratio in high-managerial-ownership firms by 1.5 percentage points (red bar on the left), but results in a reduction of less than 0.5 percentage points in low-managerial-ownership firms (blue bar on the left). 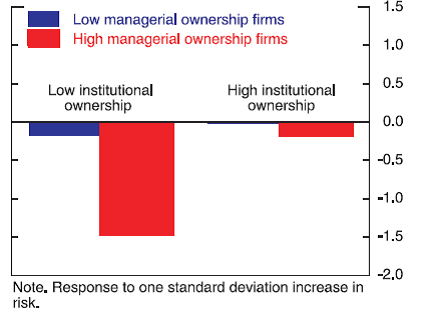 The pair of bars on the right shows that in firms with high institutional ownership, the same increase in firm-specific risk does not have a substantial impact on investment, regardless of the amount of managerial ownership. Papanikolaou and Panousi’s analysis separated the effect of firm-specific risk on investment from larger business trends. Even so, they observed that for both high-managerial-ownership and low-managerial-ownership companies, firm-specific risk increased in hard times—by about 50 percent between 2006 and 2009. During the recent financial crisis, the investment-to-capital ratio declined much less steeply—2.5 percent—for firms that had low managerial ownership as of 2006 compared with firms in the top quintile of managerial ownership—more than 5 percent. Papanikolaou and Panousi conclude that the well-known effect of aggregate macroeconomic uncertainty on investment is amplified by the decline in investment that results from managerial risk aversion. When firm-specific risk increases, firm investment spending tends to fall. This negative effect on investment spending is stronger when the managers own a larger fraction of their firm’s shares. The explanation is that when executive managers receive shares of equity in their firm, their individual vulnerability to firm-specific risk increases. Papanikolaou notes that stock options are currently not in favor as a means of compensating managers. He agrees there may be downsides to stock options, but he believes his research provides one reason for including them in the management compensation package: options can provide managers with some protection against idiosyncratic risk, thereby reducing the impact of risk aversion on firm investment behavior. Papanikolaou emphasizes that concern about specific outcomes can have a significant effect on investment. Concerns such as “Will people buy our product?” or “Will we have enough money for expansion?” can cause managers to shy away even from investments associated with reasonable risk. His research indicates that properly designed compensation packages and the presence of oversight from institutional investors can help reduce the negative impact of idiosyncratic risk on firm investment. Beverly A. Caley, JD is an independent writer based in Corvallis, Oregon who concentrates on business, legal, and science topics. Panousi, Vasia and Dimitris Papanikolaou. 2012. “Investment, Idiosyncratic Risk, and Ownership.” Journal of Finance. 67(3): 1113-1148.